So it’s that time of year again, get ready for toffee apples, parkin, and fireworks! Its only late September and I can hear the odd firework even now. Unfortunately for some dogs this means it’s time to hide. The random booms and fizzles can be terrifying. Some dogs may hide in the corner, pace up and down or find it hard to settle. While others will positively panic. I once encountered a Staffordshire Bull Terrier who had such a bad fireworks phobia she scratched at the door so much her paws were bloodied in her attempt to escape. Another managed to jump a five foot fence, falling 20 feet onto the road below. Thankfully she survived relatively unscathed. Often people celebrate starting from the week before to the weeks after. At its height on the night itself or the closest weekend. This is nearly two whole weeks of potential stress and fear for your dog. New Years Eve can be even more intense, but thankfully mostly only a few short hours. How do I know if my dog is scared? Signs of fear and anxiety in dogs can range from mild to severe, and some of these may be subtle. scratching at doors or windows. It’s not too late to start training right now. 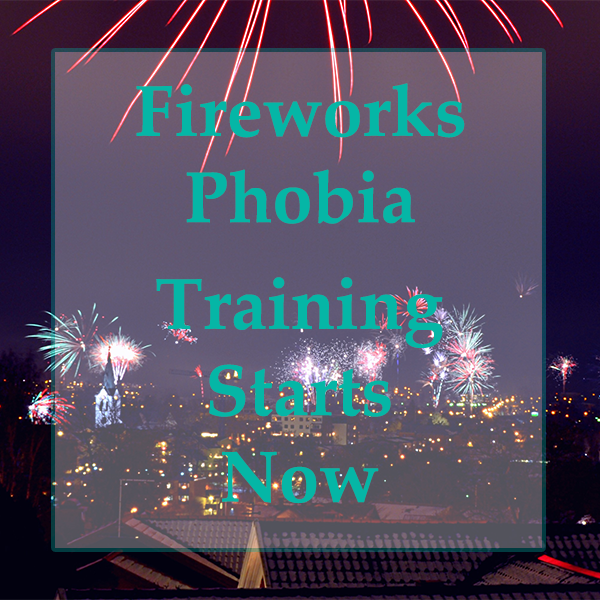 Using desensitization and counter conditioning (click here for more info) we can help your dog cope with fireworks phobia. There are plenty of CD’s on the market (plus videos on youtube) which can help emulate firework noises. Beginning with the sound on a very low level, your dog can be taught to relax while the sounds are playing, slowly building up to being loud and random. But it’s November 5th already. HELP! So you left your training too late for bonfire this year, what can you do! The first thing you can do is learn from it and start training for NYE and next bonfire night. Now that I have told you off for leaving it too late, there are ways that you can help ease the fear. Exercise. Exercise is a calming, stress relief for your dog. Make sure he gets some fresh air before the fireworks start. Keep your dog inside. Your dog may attempt to escape the garden when scared, and pain will be the last thing on his mind. Provide a safe, den like space. Dogs feel safer in enclosed spaces, put a blanket over the top and 3 sides of his crate and provide a quiet corner for him. Keep curtains and windows closed. This lessens the sounds and minimises flashes. Keep the PetRemedy handy. This is fatanstic for use along with the Thundershirt to calm the anxiety. Just spray on the Thundershirt, in his create, or on your clothes to help keep him calm. Give him a yummy stuffed Kong. Not just the usual stuffed Kong. This has to be the King of Kongs (for George this is the Sunday lunch Kong). I recommend giving him this when he is in the den. Play relaxing dog music. Yes this actually works! I use this music to calm George when he is bored in the office. Plus it lessens the fireworks noises. Of course, these steps are only managing the problem. Training should be done throughout the year, more intensely from September to January, but don’t forget at least once a month throughout the summer months so that your dog doesn’t regress. Giving affection to a dog when he is scared will reinforce fireworks phobia. THIS IS FALSE. Your dog runs to you for reassurance. For safety. If your dog is scared, you can’t make him more scared by reassuring him. If you were in a car crash but thankfully unhurt, a friend may visit, give you a hug, make a cup of tea and tell you it will be ok. This won’t make you more or less scared of getting in a car again. Neither will your friend ignoring you and pretending it never happened. That would just be a bad friend. So yes, it’s ok to reassure and pet your dog when he is scared.